This mobile is kinetic, only its movement is mechanically driven. Before we discuss the mechanism that makes this sculpture kinetic, let’s first describe it. There are many individual parts, aren’t there? Look carefully. Do these parts look like something found in nature? Do they look like butterflies? They do! They are made out of a type of plastic called mylar, which is very strong. Now look again. Do these butterfly-shapes come together to form one large shape? Yes, they do. They come together to form what looks like the body of an airplane! 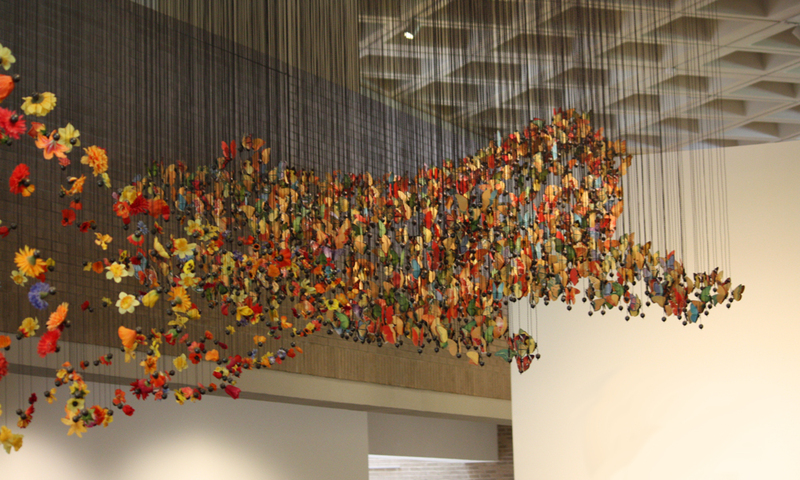 The artists made the individual butterflies come together to form the body of a 21st century jet fighter. What is streaming out from behind the jet fighter? Does it look like exhaust from a real plane’s engine? Once again, focus on the individual parts. Do these parts look like something found in nature? What do they look like? They look like flowers. The plane’s “exhaust” is made out of hundreds of fabric flowers! Think about this for a moment. Why would the artists use fabric flowers as “fuel” for a plane made out of mylar butterflies? Do real butterflies feed off the nectar of flowering plants? Yes, they do. Nectar provides the nutrients or fuel that give a butterfly its energy so it can move and live and grow. Can you name another flying insect that feeds off of the nectar of flowering plants? What about bees? What happens when bees feed off the nectar and pollen of flowering plants and then move onto other flowering plants? They pollinate those flowering plants. Bees are known for their role in pollination and for producing honey and beeswax. You many be interested to learn that a large part of our food supply on Earth (about one-third) depends on pollination by insects, mostly by bees. For example, honeybees and orchard mason bees pollinate apple trees. What would happen if these bees became extinct? Without bees, apple trees would not develop fruit. What do bees look like? Typically, bees are fuzzy and have a long tongue that helps them to obtain nectar from flowers. Bees also have antennae and two pairs of wings. You be interested to know that bees carry a static electric charge. Why is static electricity an important factor in the life cycle of flowering plants? Static electricity helps the pollen grains stick to a bee’s legs and belly. In this way, the bee is able to gather and carry pollen to other flowering plants, enabling fertilization and reproduction of those plants. 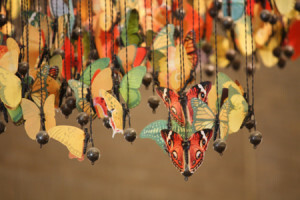 If you are lucky enough to see this mobile in person, you will notice that the wings of the butterflies slowly open and close. This is part of the mechanism that makes this mobile kinetic. Each butterfly is suspended by a stainless steel cable from the ceiling and is anchored by a small pewter weight that is a tiny replica of Earth. Each butterfly is plugged into a circuit board in the ceiling, which sends an electrical current down the cable to open and close its wings. Just as nectar and pollen are foods that provide protein and other nutrients that are then converted into energy so insects like butterflies and bees can move and live and grow, electricity is a form of energy that makes machines move. In short, the electrical current transfers energy to the mechanical parts in the mobile. These parts then apply an external force that makes the wings open in one direction and close in another direction. As we learned in our earlier entry on Benjamin Franklin, electricity can be found in nature in several forms, the most obvious one being lightening. The artists call their work Rabble. What does “rabble” mean? Rabble means a flock of butterflies. That makes sense for a mobile made out of hundreds of plastic butterflies! 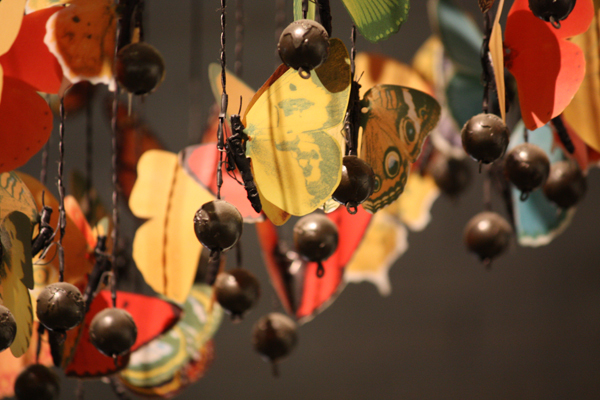 Most of the butterflies in this mobile are replicas of real butterflies, including monarch butterflies. What do you know about monarch butterflies? Monarch butterflies are probably the best known of all North American butterflies. They are protected in the United States. Their wings are easily recognizable by their orange and black pattern and the large size of their span (about four inches). Female monarchs have darker veins on their wings, while males have a spot in the center of each rear wing and are slightly larger than females. Monarch butterflies are known for their southward migration in the late summer and early autumn, when they travel from the United States and southern Canada to Mexico and coastal California. They then make a return migration to northern regions in the spring. Because all the individual parts in this mobile come together to form a 21st century jet fighter, many of the plastic butterflies have faces of key figures from the history of flight printed onto their wings. For example, on some of the wings there are the faces of the two brothers who studied the forces of nature and invented a machine to solve the problem of flight. Do you remember their names? They are believed to be the first to fly and sustain in the air a manned, engine-powered, heavier-than-air plane at Kitty Hawk, North Carolina in 1903. They were Orville and Wilbur Wright. Women also played key roles in the history of flight. On one of the wings there is the face of Amelia Earhart. In 1932, Amelia Earhart was the first woman to fly solo nonstop across the Atlantic Ocean. If you are lucky enough to see this mobile in person and you look carefully, perhaps you can spot the faces of the Wright brothers, Amelia Earhart and many other important figures in the history of flight! Would you like to see Rabble in person? All you have to do is visit the North Carolina Museum of Art in Raleigh, North Carolina. Rabble is in the entryway of the East Building at the museum. Or perhaps you would like a tour. Tours of the collection are given daily, except for Monday when the museum is closed to the public. If you prefer, you can contact the museum ahead of time and arrange for you and your friends to have a private tour. I’m sure a docent at the museum would be happy to show you and your friends Rabble and many other works of art. Whether you visit the museum on your own or have a tour with a docent, it will be well worth your time!